When visiting the Biltmore you are probably going to get hungry! Luckily there are amazing restaurants right on the property. 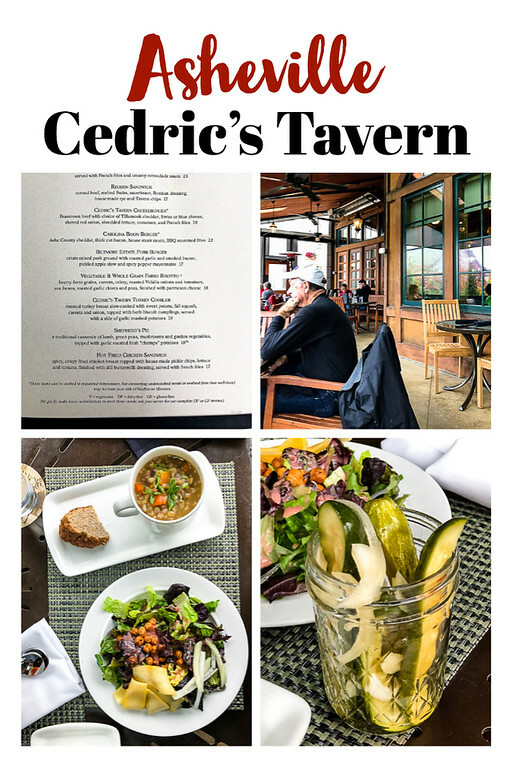 We had a delicious lunch at Cedric’s Tavern. 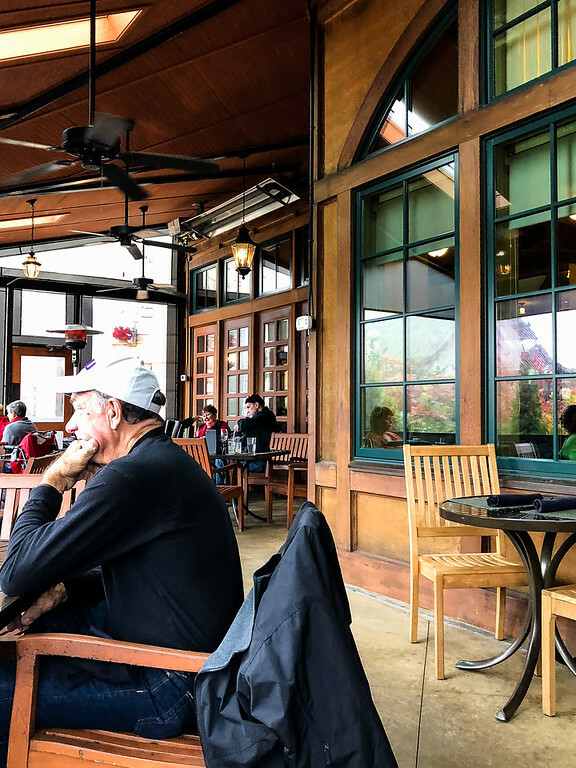 On a recent visit to the Biltmore Estate, we found ourselves there around lunchtime. Looking through the guide, there were several options for us to choose from. We decided that we wanted to drive over to the part of the estate where the Antler Village and Winery were located. We planned on visiting the winery when we finished eating. Antler Village has three restaurants: Village Social, Bistro, and Cedric’s Tavern. 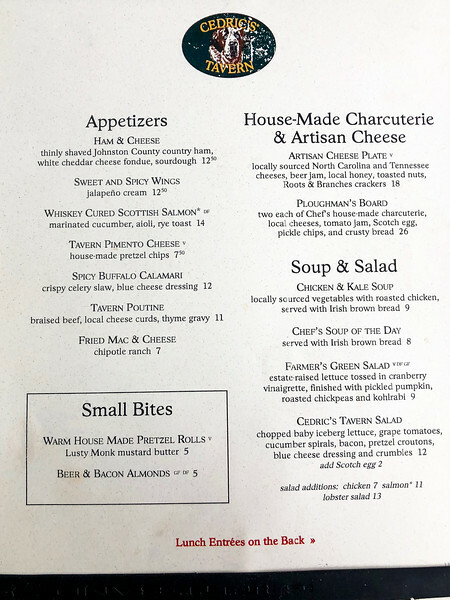 We settled on Cedric’s Tavern because pub fare sounded good and it was raining and it was the first restaurant that we saw! We walked in and were immediately greeted by a server. She took us by a gorgeous bar and led us to an outside patio area. The area was like a sunroom, with a pub feel and lots of warm wood tones. As we perused the menu, our waiter took our drink order. Practically every single thing on the menu sounded amazing. Appetizers that immediately stood out were: Whiskey Cured Scottish Salmon, Tavern Pimento Cheese, and Tavern Poutine. Then there was the House Made Charcuterie and Artisan Cheese. 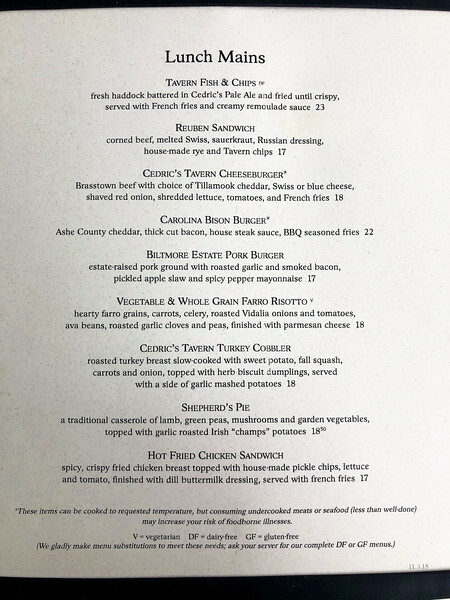 On the lunch mains: Tavern Fish & Chips, Biltmore Estate Pork Burger, Vegetable and Whole Grain Farro Risotto and Hot Fried Chicken Sandwich all sounded good. The problem was that it was a late lunch and we didn’t want to eat too much since it was only a few hours until dinner. 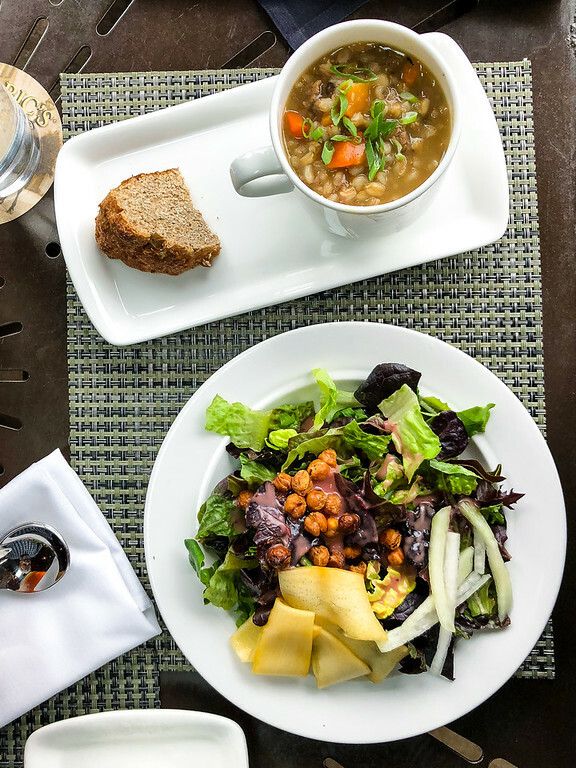 So, we settled on the soup of the day and the Farmer’s Green Salad. The lunch was perfect! The soup was a warm and comforting whole grain farro soup. It was pure comfort food and the slice of Irish brown bread was delicious. The Farmer’s Green Salad was so good. It’s estate raised lettuce tossed in a raspberry vinaigrette. (As we drove out, we saw all the fields of vegetables.) It was topped with pickled pumpkin, toasted chickpeas and kohlrabi. It was the perfect blend of textures and flavors. The highlight was the housemade pickles. I am a sucker for housemade pickles. Any restaurant that takes the time to make their own pickles jumps to the top of my list. 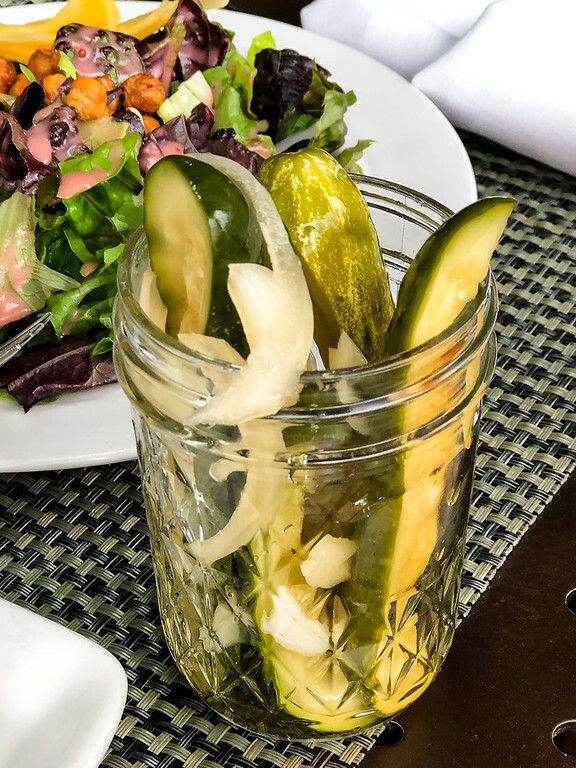 A mason jar was filled with pickle spears and pickled onions. They were so good. You can buy jars of the pickles and I also found the recipe online, so I will be making my own! That’s a nice menu, I would love to eat there. You are giving me ideas for when we can travel in our RV. I want to see the US and try so many restaurants, see the historic sights. I love that photo of you, so jealous of your long hair. Mine is coming along……I’ll get that braid yet! When you start traveling in your RV you need to come to Chattanooga, or at least North Georgia! Oh, we plan to! We actually shopped online for condos and houses in Chattanooga area but we’ll likely just stay in our home here. I want to meet you, have drinks, see the cats! (sad face)….just a wee bit envious.